Ukraine Southern Airlines plane flying from Odessa to Donetsk has crashed and caught fire during an emergency landing near the city of Donetsk. According to latest official reports 44 people including 8 crew members were on board the jet en route from the Black Sea resort city of Odessa to Donetsk. Initial reports however suggested that 45 people were on board and 39 of them have been safely rescued from the aircraft. Those rescued were relocated inside the airport building. Several ambulances were dispatched to the airport. Five people have been killed. So far there’s no official information on the cause of the crash. Preliminary reports suggest that the plane made an emergency landing due to an engine malfunction. Thick fog conditions were also reported in Donetsk. 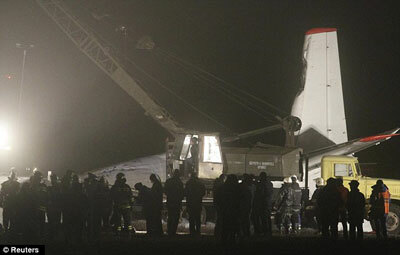 A local media source says the plane overshot the runway and stopped in the field where its undercarriage gave way. The aircraft turned upside down and broke in three parts. The aircraft came to rest about 700m from the runway, AFP reported citing a local police source. There were reportedly football fans onboard, who were heading for the Champions League’s last 16 first-leg game between Shakhtar Donetsk and Borussia Dortmund. The airport has been closed after the tragedy and is not accepting any flights. A commission has been set up to investigate the deadly crash. The Antonov AN-24 is twin-engine 44-seat transport aircraft. The An-24 does not comply with Ukraine’s latest regulations imposed in 2008. This jet has no radar warning system for approaching other aerial objects, Komsomoslkaya Pravda in Ukraine newspaper reports. In 2011 Russia’s then President Dmitry Medvedev called for an end to the use of Antonov-24 jets along with Tupolev-134 planes in Russia following several crashes involving those aircraft. However, the Ministry of Transportation rejected his initiative.